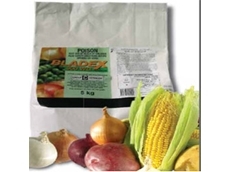 Bladex is a weed herbicide which can be used to control weeds in various vegetable and field crops. David and Peter Ricardo are zero till farmers growing cereals,oil seeds and grain legumes. Herbicides, Fungicides, Insecticides and other agricultural crop protection solutions the latest and most innovative agricultural chemical company. Viterra is a global agri-business and supplies a range of food ingredients to the global food chain including grain, malt, feed and wool. Viterra also supply a range of agri-products including crop protection, fertilisers and seeds. 23/07/08 - Ospray offers a wide range of seed dressing, regulants, adjuvants and cotton defoliants. 04/07/08 - Agracorp is an exporter and marketer of a diverse range of quality grains. 03/07/08 - A & B Grains is specialised in trading cotton seeds sourced from suppliers all over Australia. 02/07/08 - A & B Grains is highly equipped to provide quality service for customer specific coarse grain requirements. 01/07/08 - A & B Grains based in Oakey Queensland, has been in providing quality birdseeds for over 50 years.